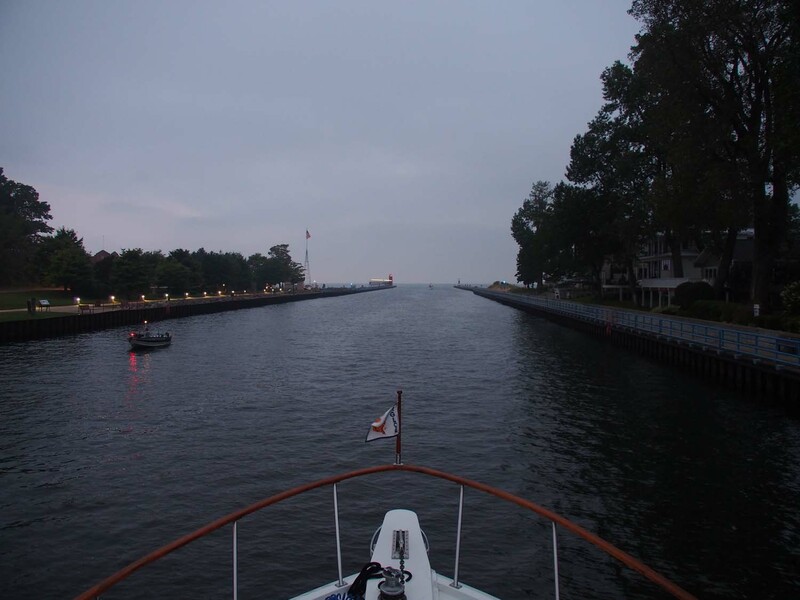 It’s 7 AM in the channel out of South Haven to Lake Michigan. We spent two nights in South Haven, but the second day (Saturday) there was rain pretty much all the time, so we didn’t go into town and missed the farmers market. The big lake was still said to be pretty calm, so we left Sunday morning at 7 for Chicago 70 miles across, in a straight line. The first half was calm while the second half was just a bit of rocking from low beam waves. 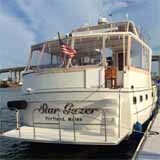 It wasn’t bad, but never seems as calm as I anticipate from the weather and wave forecasts. Boats going to fish on Sunday passed ours in the dark before we left. We saw them our first few miles out. 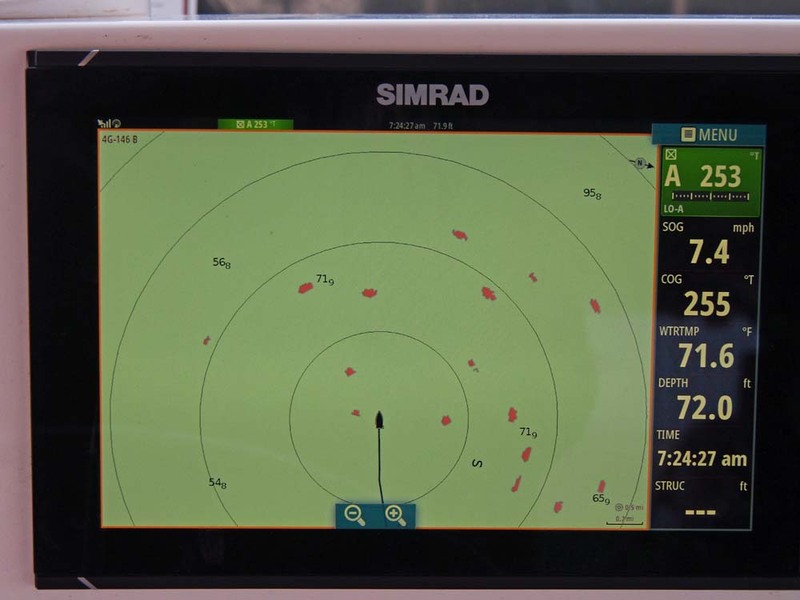 Notice near the bottom that I changed course to keep us and our wake further from other boats. Each circle is .5 miles out. Most of the trip was a little foggy, but visibility was more than a mile, so the radar was not really necessary. Unlike NYC, where we saw our destination within 20 miles, we had to get within a mile or so before anything of Chicago appeared. Near Chicago visibility was good enough that radar was not required, but just. Once we got within the first breakwater things got pretty busy. Many boats going in different directions. We had to change course or slow down several times. Hundreds of boats on mooring balls greeted us within the second breakwater. 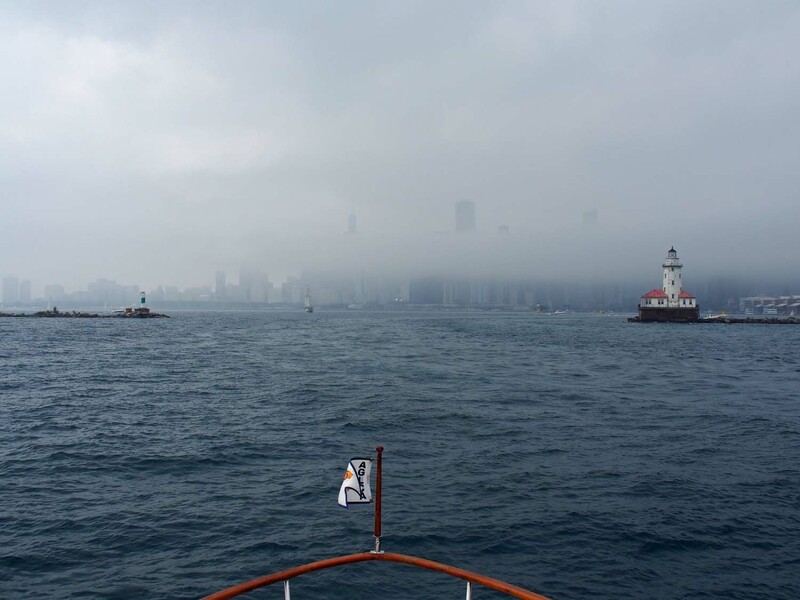 There was a none too wide channel to get past all of them and into DuSable Marina, where we docked about as close to the Loop as a boat can get. We’ve not seen Chicago before except one night out I had years ago when doing a trade show here, so we intend to stay a few days and see the sights. Entrance in the first breakwater of the Chicago harbor.